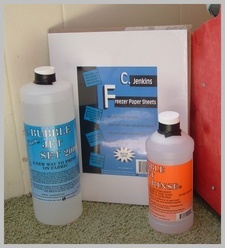 Here's the Bubble Jet Set 2000, the Bubble Jet Rinse and freezer paper. 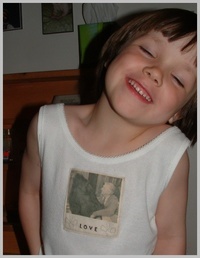 I bought it from Dharma Trading this week for getting images on fabric. It seemed pretty straightforward--you soak your fabric in the solution, and then iron the fabric onto the freezer paper, and feed that through your printer. Then you wash it with the rinse set to "keep" the image. I made an attempt at it this past weekend. It was a bit harder than I thought--the colors came out funky, and the paper/fabric kept getting stuck in the printer (ruining a piece of fabric each time--let's not think about what it's doing to my new printer). I think I'll do some playing around with different fabric (I used unbleached muslin), and see what happens. I was happy with how it really printed/absorbed on the fabric, as opposed to those iron on things I've used in the past that give it a plasticky feel. 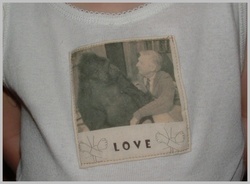 Here's the attempt--and don't laugh--the image is of Mr. Rogers and Koko the gorilla--Calvin's two favorite beings--with the word Love and the sign for love. Do you see how thrilled he is with this?! I need to figure this stuff out--I've committed myself to a crazy project this month--a wall quilt for my parents anniversary with pictures of their new log cabin. Um yeah, that would be me-- me who's never made a quilt before--let alone one with pictures on it. I think I've lost my mind. So has anyone used this bubble jet stuff? Any tips or experience to pass on?